This book offers an interdisciplinary overview of the role of law in modern capitalism in the context of financial crisis. In this work, the reader will find a discussion of key issues relevant to the crisis that have occupied the pages of the financial press since 2007 including an assessment of the meltdown of the sub-prime mortgage market, the credit crunch, the European debt crisis and the turmoil in Greece, plus a series of theoretical contributions that are aimed to challenge perceptions of the market-state relationship and the place of law within it. The book includes a methodological defence of the state-market dichotomy, a critique of the tenets of neoclassical economics, and an evaluation of what the financial crisis heralds for the future of the political economy of western democracies. Ioannis Glinavos argues that it is a mistake to associate markets with freedom and states with oppression, and suggests that more choice for consumers can -and does- mean less choice for citizens. The book suggests that a new social contract is needed to ensure the survival of both capitalism and democracy. 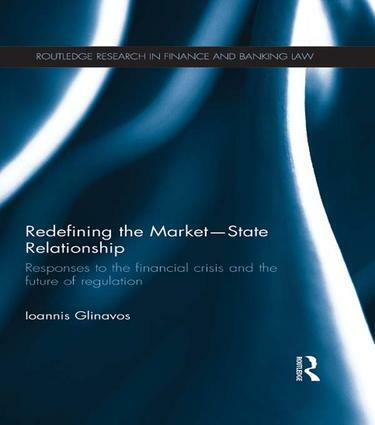 In contributing a unique, legal perspective to the underlying dynamics of the financial crisis, this book will be valuable to scholars and students of regulation, financial markets and economic development.